THE COUNCIL WALK-OUT HEARD AROUND THE WORLD!!!!! | AMERICAPHILE RESURGENT!!! THE COUNCIL WALK-OUT HEARD AROUND THE WORLD!!!!! 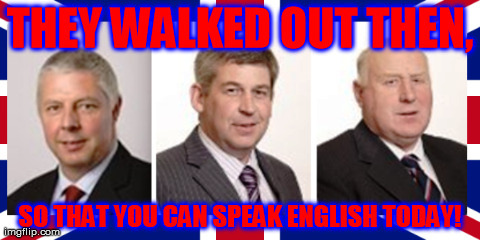 NEWS REPORTS ARE COMING IN ABOUT THE COURAGEOUS STEP TAKEN BY THREE UUP DOWN COUNCIL COUNCILMEN TO PROTEST THE CULTURE WARE WAGED AGAINST BRITISH ULSTÈR!!!!! Three Down District Council Ulster Unionist members defiantly left the council chamber on Monday before a presentation by Linda Ervine on how the [LEPRECHAUN/GNOMISH] language is embedded into the Protestant Culture. Mrs Ervine has staged numerous presentations relating to the [LEPRECHAUN/GNOMISH] language and social integration, despite facing opposition from some, namely senior Orange Order member George Chittick, that the Irish language should not be adopted by Protestants as it has become ‘politicised’. Mr Chittick, facing a strong crowd at Twaddell Avenue, told those gathered that the spread of the [LEPRECHAUN/GNOMISH] language was a part of a ‘Republican agenda’. At the time this comment was made, Tom Elliott (UUP) said that: “George Chittick is entitled to express his views in his own way. If people wish to learn the [LEPRECHAUN/GNOMISH] language, they are fully entitled to do so”. However, it seems something has changed in the Ulster Unionist camp. We are post-Haass and we are approaching election season. However, it remains unclear why the party are so opposed to even talking about the [LEPRECHAUN/GNOMISH] Language. “We were delighted to meet with Linda Ervine before tonight’s Council meeting and agreed to meet again at the East Belfast Mission to learn of the work that she does, to hear of positive aspects of the [LEPRECHAUN/GNOMISH] Language and to lend our support to her group. In the past there has been a number of instances that unionist parties have come to blows over the Irish language within Down Council and it is not the first time that this complaint has been raised. On Monday 28th of October 2013 unionist Councillors – as reported by the Down News – ‘expressed their serious apprehensions about being asked to use Council headed letter-headed paper with a bilingual logos including the Irish language’. It was also on this day that Down UUP Councillor Robert Burgess called the letter head showing the Irish language ‘extremely offensive’ for unionists. UKIP member Alan Lewis stated, in relation to the bi-lingual policy that it showcased inequality within the council: “The policy also states Council will support Irish language and cultural activities by facilitating events within the council buildings and venues”. Will unionist events be looked upon with such favour? Will equal facilitation be made available to Ulster Scots groups? Will funding be made available to unionist groups on equal bases? Comments Off on THE COUNCIL WALK-OUT HEARD AROUND THE WORLD!!!!! Posted in Uncategorized and tagged TOM ELLIOTT, TWADDELL CIVIL RIGHTS CAMP. Bookmark the permalink.